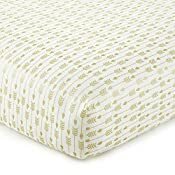 The 5 Piece Crib Bedding Set includes a Quilt, 100% Cotton Crib Fitted Sheet, Dust Ruffle, Diaper Stacker and a large "mural-like" Wall Decal with the phrase "Dream Big Little One" featuring a teepee, arrows and a fox. 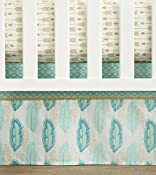 Features Aztec inspired prints and patterns in a vibrant aqua and teal color-way with accents of metallic gold. 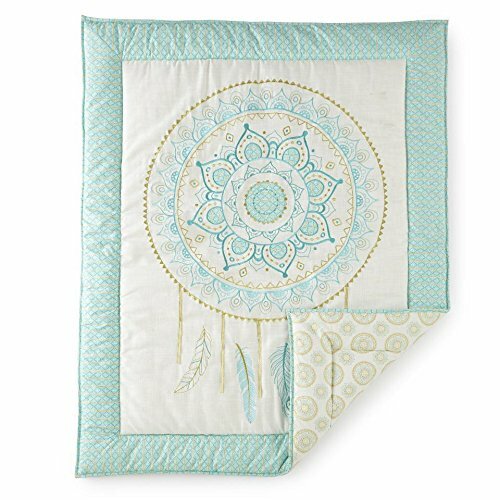 Feather embroidery is carried throughout the quilt and diaper stacker.